I know I don’t usually post on Sundays, but when Fresh & Easy asked me to share my favorite cooking hack to be included on their “Hacks of Life" Pinterest board I thought you wouldn’t mind a quick ‘bonus’ post from me this week. As you can guess, as a mom of three kids and a pretty much full time blogger and slave to social media, I am a busy lady. So when I buy produce I like to get everything prepped in advance, so when the time comes all I have to do is pull something out of the fridge and serve it. So once I have prepped and washed my lettuce, how to make it last as long as the bagged stuff? 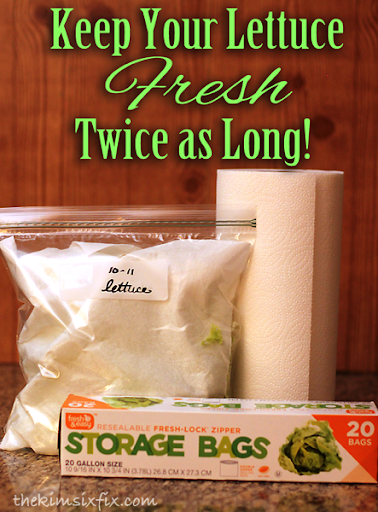 I insert the lettuce pieces making sure to keep them out of contact with any of the surfaces of the plastic bag. I have written about my love for Fresh & Easy before and I am actually a shopper there. I really do love the store. Fresh & Easy’s target shopper are people who want healthy (anything with the Fresh & Easy label is guaranteed to be all natural with no artificial flavors or dyes) and wholesome yet EASY food. The fact they have high quality products that range in convenience from raw ingredients to heat-n-serve make them a great flexible option no matter how much or little time you have for preparing dinner. I use their ready to cook ingredients frequently and have never been disappointed in the quality or flavor. Do you have any kitchen hacks that you can share? I’d love to hear about them! This post was written by me on behalf of Fresh & Easy.